1. Proverbs 19:5 says that those who lie “will not go free.” How do lies generally lead to more lies and more problems? 2. In Luke 22:54-62, Peter told a series of lies that made him miserable. Jesus had said that Peter would deny knowing him three times before morning. Peter was sure it wouldn’t happen. But then Jesus was arrested by an angry crowd and led off to the high priest. Peter followed, but he didn’t want anyone to know that he was one of Jesus’ apostles. He thought he might be arrested too. A servant girl saw him and told everyone he knew Jesus. Peter said, “I don’t know him.” A little later, another person made the same claim, that Peter was one of Jesus’ followers. Peter said, “I am not!” And then a third person said they’d seen Peter with Jesus. Peter replied, “I don’t know what you’re talking about.” Just then, a rooster crowed, and Jesus turned and looked at Peter. This made Peter miserable. He went outside alone and cried because of his lies. As you listen to this episode, think about how lies can lead to more lies and more troubles. In this episode, Scooter learns that lies lead to more lies which leads to more trouble. The only way to avoid the trouble is to tell the truth. God gave Adam and Eve one rule in the Garden of Eden. He told them not to eat the fruit from one tree. He said that if they ate the fruit, they would die. But Satan told Eve a lie (Genesis 3:4). He told her she would not die, but instead would be like God. Eve believed the lie and ate the fruit. Immediately, she began to die. The very first lie caused sin to come into the world. It’s because of that sin that all of us have to die. Satan’s lie might not seem like much, but it led to a world of problems. Want to dig deeper and learn what God says about lying? Read Proverbs 12:22, John 8:44, and Colossians 3:9. Why did Scooter leave Liz and Lucille’s table unattended? He was invited to play kickball at recess. What happened to Liz and Lucille’s baked goods? What was the first lie that Scooter told? Why? That Spike took all the baked goods. What other lies did he have to tell to cover up the first lie? He blamed Skink and then Liz and Lucille. 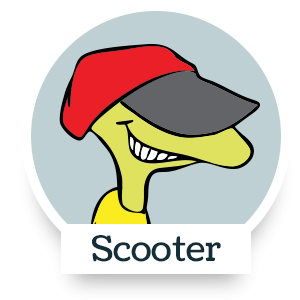 How did Scooter get free from all the lies? Ask your parents or other trusted adults about a time when they told a lie that led to more lies that led to a lot of problems. How did it end? What lesson did they learn as a result? Talk with them about how much easier it is to tell the truth at the first opportunity.